Newly married couple Deepika Padukone and Ranveer Singh set the dance floor on fire at Isha Ambani and Anand Piramal's pre-wedding party in Udaipur, which was held on Sunday night. 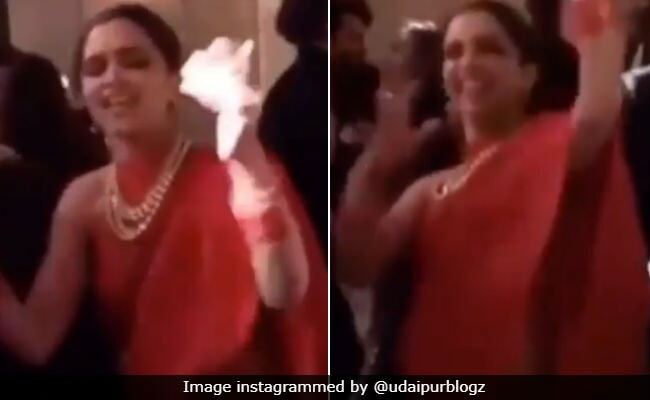 Videos from inside the star-studded bash have been shared by fan clubs and made to go crazy viral, in which Deepika and Ranveer can be seen dancing to songs such as Chogada, Malhari, Gallan Goodiyan, Single Ladies and others. In one of the videos, Deepika can be seen grooving to Chogada with the DJ and dancing like nobody's watching while in another, Ranveer joins Karisma Kapoor with his epic dance steps to Subah Hone Na De. But the song which saw both Deepika and Ranveer take the centre stage to is Malhari from the couple's film Bajirao Mastani. Ranveer and Deepika were truly the heart and soul of the party! Ranveer and Deepika also shared a slow dance and were chilling at the party hand-in-hand, more videos revealed. Here's a better look at Deepika Padukone's outfit for the evening. WOW. Isha Ambani and Anand Piramal's pre-wedding party was made a blockbuster event not just by Deepika and Ranveer but also by Shah Rukh Khan, who introduced groom-to-be Anand Piramal on stage. Bollywood apart, pop queen Beyonce was the star performer of the night! What a night it was! Meanwhile on Monday morning, Deepika Padukone, Ranveer Singh, Shah Rukh Khan, Aamir Khan, Disha Patani, Vidya Balan and Varun Dhawan, who were all part of the Ambanis' guest list for the pre-wedding party, touched down in Mumbai. Isha Ambani and Anand Piramal's wedding is scheduled for December 12, which will be attended by the close acquaintances of both the families in Mumbai. Earlier this month, the Ambanis had attended Ranveer Singh and Deepika Padukone's wedding reception in Mumbai.